Food parcel & friends. | La Rosilla - Lifestyle and food. Where would I start ?, with a myriad of marvelous mouthwatering dishes out there, from every type of cuisine in the world. Something simple, tasty & healthy I thought. ‘Oh I have some spinach too‘ she messaged – This was beginning to be like ‘Ready, steady cook’ on-line. ‘Oh also did I tell you, I don’t know how to prepare fresh langostinos ? ‘ She quietly advised. ‘O.K – I’ll bring food parcel & wine, you provide the kitchen & expertise ‘ She announced. So Kate duly arrived the following day, with hamper in tow. 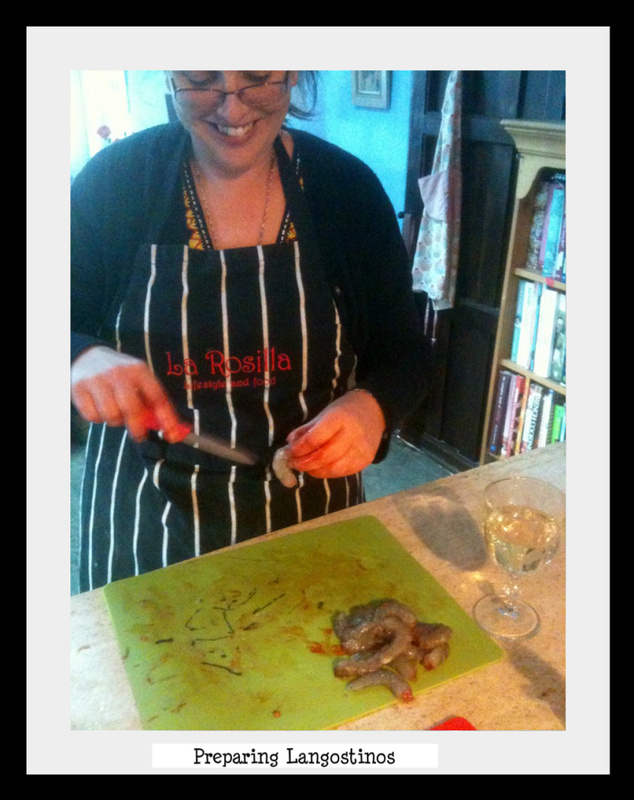 We set about preparing the deliciously fresh langostinos, heads & tails off, a glass of wine at hand to ease the squeamish task for Kate of de-veining , ready for our chosen dish. So what did we choose ??? 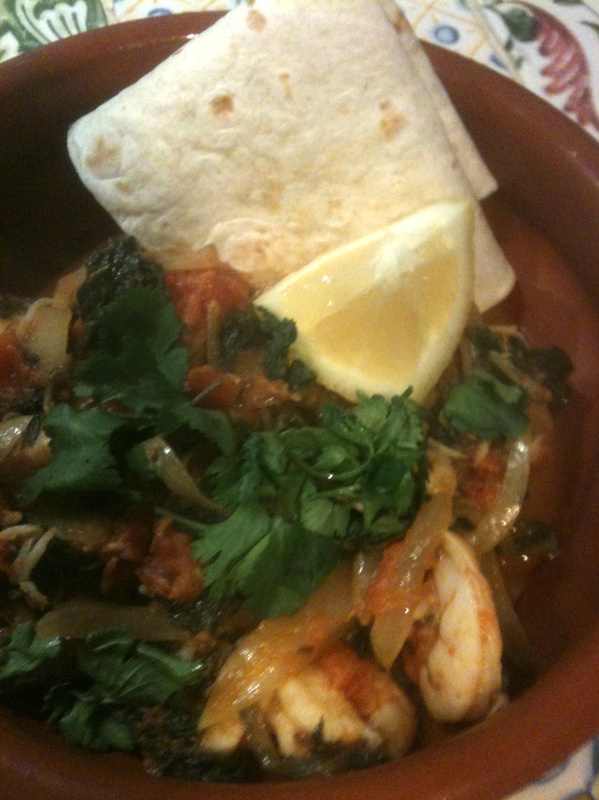 Moorish Spiced, Prawns & Spinach. – Delicate in flavour with a hint of warming spice. 2 large handfuls of fresh shelled prawns. Gently saute onions in olive oil, until softened but not brown. Add garlic and fry for 1 min. Add cumin seeds and fry for 1 min. Add toms & harissa paste. Simmer gently for 5 mins for flavours to infuse. Add the spinach, and allow to wilt in sauce for 5 mins. Stir in prawns and allow to cook gently in the simmering sauce for 5 mins or until opaque & pink. Once all cooked, serve in rustic bowls, with a folded flat-bread a wedge of lemon and chopped coriander and a dusting of cinnamon.